Tokens. A blog by Artist David Wills. : Art Martha. 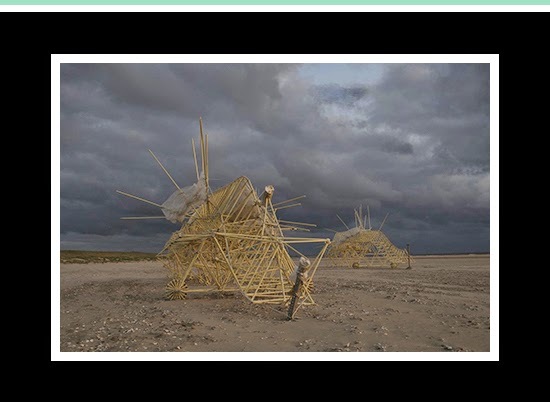 Generator Strandbeest. There's something prehistoric about Theo Jansen's rather odd sculptures, part of his installation Generator Strandbeest showing now in Electriciteits Fabrique near the centre of Den Haag. One of the problems with using such an interesting venue, particularly one that the public doesn't have access to normally, is ensuring that building and art don't compete for audience attention. Here the space enhances the work, giving it another dimension more in line with an archeological dig. Or a sci-fi film, I couldn't help but think of the desert scenes in first Star Wars film. It's as if you have stepped back into the past and into the future in one stride. I spent a good hour or more wandering around, watching the audience interact with some of the beasts as well as spending some time looking at the museum-like installation of component parts. Highly recommended, an odd yet warming experience.